I needed somewhere to vent my frustrations so stick with me folks. It is not a beauty product moan but it is related to my allergies. Let me set the scene. When I am travelling I love nothing more than browsing the local supermarkets and discovering new foods. My holiday memories always connect back to food. I remember the first time I visited the USA my friend and I headed straight to a grocery store and purchase every snack we had ever heard of in a movie or TV show. Don’t even get me started on Australia I spent a year there and came home with a backpack full of newly discovered treats. So the point to all this is whilst in Amsterdam I discovered Alpro Macchiato Soya drink. Alpro is a brand available in the UK but this particular flavour does not exist here. Have you seen all the flavoured cows milk? Little old me with her milk allergy gets a choice of Chocolate or Strawberry. Now perhaps I should be grateful for this after all when I was a child flavoured soya milk was non existent, but as an adult I have been treated to these choices and now I know the possibilities are there I want more choice. So what’s the point of my rant you ask? 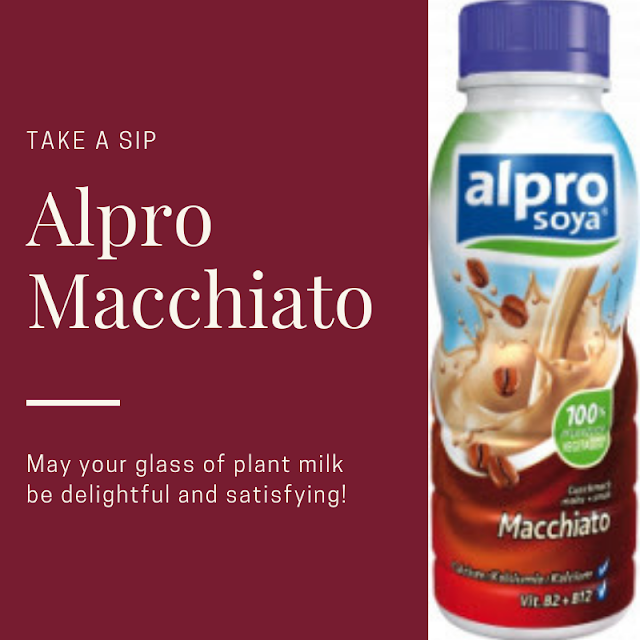 Well, I wrote to Alpro and told them I was now addicted to Macchiato why can I not purchase it in the UK . The reply was "The Soya Macchiato was introduced to all buyers of the major multiples, unfortunately it was not regarded as a saleable product to the UK market so is not currently available. Please rest assured that we will continue to try to introduce this product, as UK tastes are continually changing and may well be something which will be accepted in the future." It annoys me how everyone assumes British tastes buds are bland and boring. What I do not understand about this explanation is the UK is being taken over by Starbucks and Costa Coffee so why on earth would Macchiato not be saleable? Also it frustrates me that the big supermarkets dictate what we can buy. Since Free From foods are a niche market they take up valuable shelf space from "normal" foods. This is not the first time I have been told supermarkets will not expand the range of a certain Free From brand. They chose what they think will be popular and we are none the wiser that a brand has more to offer. So next time you are at the Supermarket think of me. After 25 years it has got a little bit easier to cope with my allergies but it still has its moments of frustration. My sister has food allergies/an auto-immune disease, so I know how frustrating it can be finding products you like! Or worse yet, you find it somewhere and it's discontinued! Oh, that is terrible! Living with allergies can be difficult. Especially when you are allergic to something so common, something used everyday. Thank god, soy is available more than it used to be. @Staci - yes the discontinued factor is always a pain I had that recently sometimes it is the supermarket wanting shelf space rather than the makers of the product. @Su - actually I have OZ to thank for my love of Soya milk before I went there I never drank the stuff. When I live in OZ flavoured soya milk was in the supermarkets completely unheard of back in UK. Also I was able to go to a cafe and order a soya milkshake. I have wonderful memories of a little cafe on the edge of the rainforest that did the most amazing soya smoothie I have ever tasted in my entire life! The point that really bugs me too is that the buyers in the supermarkets often have no allergies or intolerances so base their decisions solely on profitability. I don't expect any shop to make a loss but there appears to be no customer consultation at all!